Fancy being involved in a VERY special Ukulele Flash Mob? One For the Political Activists..
TONIGHT! For the Politically Opposed to the Conservatives. 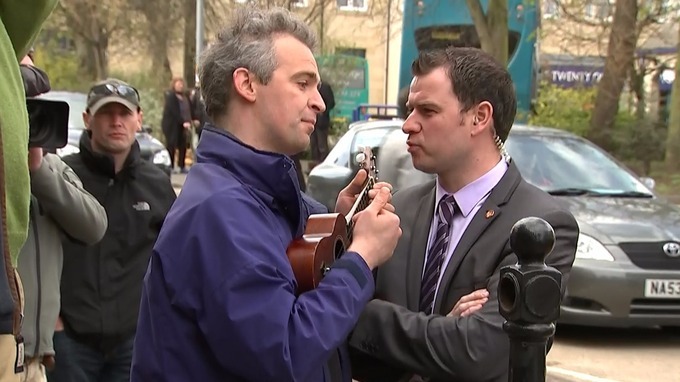 You may have seen on the News that a ukulele playing busker greeted David Cameron in the North East, with a song F&*k off back to Eton? If not, click here to read the news and if you did, and you’d like to support our old friend Robin Grey, with his 6pm flash mob, take a ukulele (and, if you can, a blue balloon) to Kings Cross Station. Meet Robin (in the photo above) at 6pm in the public space outside the front of Kings Cross Station. To find the lyrics, and chords, please find Robin, and his Nan, here, in this lovely video.